Don’t let the race name fool you: While the race proceeds benefit the Rails-to-Trails Project, very little of the course is actually run on trails. This is a flat, fast course that is run nearly 80% on paved streets. With a nice down-hill start, many PR’s have been set on this course. The course also offers several other benefits: Runners and walkers start a minute apart to help ease congestion at the starting line. Every half mile is clearly marked with split-timing coming at the one- and two-mile marks. Aid stations are also at the one- and two-mile markers with plenty of ice, water, and PowerAde for everyone. Participants also get to run through the historic train tunnel. The course is also unique in that the one-mile mark is near the registration area/finish line so that your loved ones may cheer you on several times during the race without having to move around all that much. When reaching the finish line, you’ll be greeted by D.J. Mister Twister’s music to help give you that little extra “kick” during the last tenth of a mile. Canines: Top 10 Overall dog WALKERS. (Gender irrelevant) NO RUNNING! Keep dogs on a 5’ locked leash at all times! Walkers: 1. Top 12 Male, Top 12 Female 2. Top 3 Male, Top 3 Female Masters (50+) 3. Top 3 Male & Female in Age Groups unless otherwise indicated. Runners: 1. Top 3 Male, Top 3 Female 2. Top 3 Male, Top 3 Female Masters (40+) 3. Top 3 Clydesdale Male (200 lbs+), Top 3 Lady Athena Female (150 lbs+) 4. Top 3 Male & Female in Age Groups.NO DUPLICATIONS! (Walk): 12+ Under, 13-19, 20-29, 30-39, 40-49, 50-59(4), 60-64(4), 65+ Over(5) NO DUPLICATIONS! 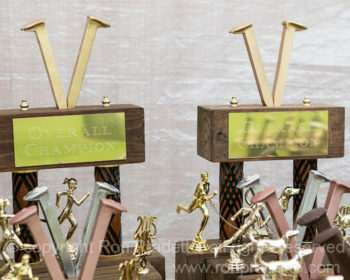 We proudly offer more awards than most 5k events anywhere. And when I say awards, I don’t mean some little medal. These are the famous, unique, beautifully hand-crafted, railroad spike trophies. 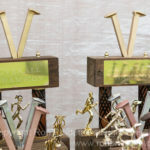 Veterans of numerous races over the years tend to put their medals and cheesy-looking trophies in junk drawers or boxes in the basement. We have weight divisions, a Masters Division and a special K9 Competitive Walk Division! This is an award you’ll be proud to display for years. And, we have lots of them: Over 200! We also have lots of door prizes. Every year, we collect between 100 and 150 door prizes from generous businesses/merchants in and around the tri-state area. Your chances of winning one are good. Those who pre-registered are given a race packet generally found only at marathons: jammed full of goodies and samples. Once you’re done racing, it’s time to eat! We offer the biggest smorgasbord of delicious food: Some of the menu has included: Domino’s pizza, Subway subs, Bob’s Carry Out pizza, Fox’s pepperoni rolls, Hollie’s Cookie Hut home-made cookies, and all the beverages you can drink. If you leave this race hungry, it’s your own fault! The first 350 registrants are guaranteed a moisture-management shirt. Runners and walkers love ‘em because you can work out in them and they feel cool against your skin. Did I mention the kids’ race? After the 5k race, the 200 yard Fun Run for Kids is held. Every child wins an award, handed to them by Spike and Buck, the Wheeling Nailers’ Mascots. The cost is only 5 bucks. And, the first 100 children to register are given an athletic bag jammed full of toys, coupons, certificates, and other goodies! This race has been voted the “#2 Favorite Race in the Ohio Valley” by the Grand Prix Participants multiple times (2nd only to our sister race, the Pumpkin Festival 5k). So come on out and see what everyone is talking about! How to Find Start Line: Interstate 70 E/W, Take Exit 202. Go South on Ohio State Route 800 for 6 miles. Proceed to 2nd Red Light. Turn left. Go 1/4 mile. Follow signs.